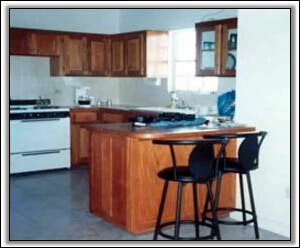 Vista Del Mar was built in 1998 with comfort and relaxation in mind. Ten sets of French doors, expansive verandahs and plenty of windows provide a light and airy atmosphere and give a taste of Caribbean living and luxury in Nevis. 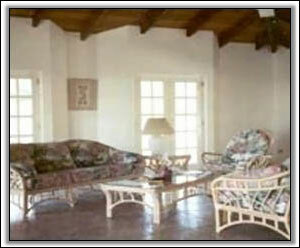 Its 3,600 square feet of living area includes spacious rooms and four covered verandahs. An 850 square foot great room leading through a mahogany bar to a large kitchen serves as the focal point for entertaining, enjoying meals or just relaxing. On the open air deck leading from the Master Bedroom or the Great room is large infinity edge plunge pool overlooking the Caribbean, offering wonderful vistas, tranquility and stunning views of the westerly sunsets. The three bedrooms (33' x 18' x 12' "L" shaped; 24' x 15'; 15' x 15') are open and spacious and contain baths done in Italian tile with mahogany cabinets en suite. All rooms have ceramic tile floors, cathedral ceilings, Casablanca fans and contain brand new wicker furniture imported from the United States. An eight-foot gate secures your privacy and surrounds a lush landscape. 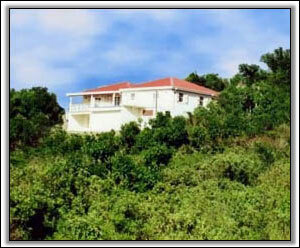 The villa affords 360-degree birds-eye views of Nevis Peak, Saddle Hill and The Caribbean Sea. If your desire is to unwind, you can spend your days by the pool with a good book. A constant breeze will refresh you both day and evening at the 950' secluded hillside location. A 15-minute walk will put you at the world-renown Montpelier Plantation. Should you wish to pursue athletic or sports endeavors, a variety abound! Golf at the Four Seasons Resort's Robert Trent Jones course is only five miles away as are diving excursions, horseback riding, snorkeling, fishing, horse racing and hiking in the rain forests. After watching the incredible sunsets from the deck, exquisite cuisine is available at the five Nevis plantations, four of which are only minutes away. Many other fine restaurants are also available or you could spend a romantic evening dining in your hillside hideaway. Many plantations and hotels offer entertainment and dancing to reggae and calypso bands. Your holiday will include maid service three days per week, a gardener and pool service as well as transportation from the airport to Vista Del Mar. Your car rental can also be arranged for you at a discounted rate.